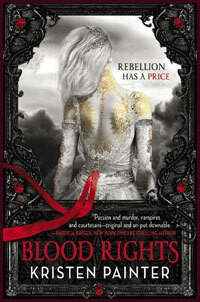 The Knight Agency Blog: Halloween Chat with Kristen Painter, author of BLOOD RIGHTS! This Thursday @ 9pm ET!! Halloween Chat with Kristen Painter, author of BLOOD RIGHTS! This Thursday @ 9pm ET!! BLOOD RIGHTS author Kristen Painter will be taking over the TKA chatroom and declaring it the Halloween-only zone in just a few days! Bring your best "costumes" (read: funny usernames) and make sure to read up on Kristen's website and your spooky holiday trivia. We have plenty of fun games and prizes planned for those that are full of the All Hallow's Eve spirit! Bwhahaha! HOW: Enter any combination of username and password to enter…if you dare! Born into a life of secrets and service, Chrysabelle's body bears the telltale marks of a comarré -- a special race of humans bred to feed vampire nobility. When her patron is murdered, she becomes the prime suspect, which sends her running into the mortal world...and into the arms of Malkolm, an outcast vampire cursed to kill every being from whom he drinks.